Brooks Brothers is a famous American brand established in 1818. It is based in New York, but now it belongs to the Italian enterpreneur Claudio del Vecchio. Brooks Brothers have a very wide range of products and several lines of shirts. Red Fleece: double-needle stitching, no gussets, centre back pleats, plastic buttons (without shanks), non-split yokes, sometimes 6 small pleats above cuffs, no hand-stitching. Sleeves are sewn on as usual. 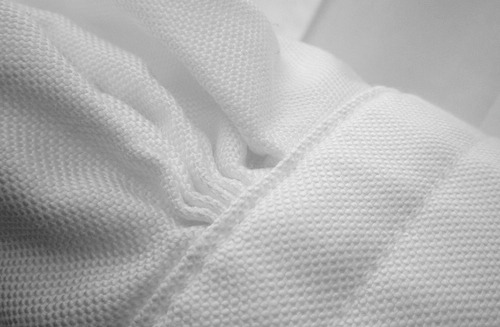 Fabrics: 100% cotton and linen + cotton (average quality); sometimes 100% Supima cotton. Prices start at 39.5 USD (no VAT). Made in China. Mainline: neat single-needle stitcthing, 6 small pleats above cuffs, no gussets, plastic buttons (without shanks), non-split yokes, centre back pleats, no hand-stitching, fused and non-fused collars, sleeves are sewn on as usual. Fabrics: often non-iron (chemical treatment, but they claim that it’s safe for health; non-iron fabrics comply with Japan’s JIS L 1041 standard), often 100% American Supima cotton. The most expensive shirts are made of 100% Egyptian cotton fabrics (woven in Italy). Prices start at 69.5 USD (no VAT). Made in Malaysia and the USA. The Original Polo Shirt: gussets, mother-of-pearl buttons, centre back pleats, button-down collars (non-fused), single-needle stitching, 100% American Supima cotton, sleeves are sewn on as usual, Made in the USA. Price: 140 USD (no VAT). Golden Fleece: single-needle stitching, 6 small pleats above cuffs, split yokes (cut on the bias), mother-of-pearl buttons, sleeves are sewn on as usual. Fabrics: 100% Egyptian cotton (sometimes non-iron), 100% wool (woven in Italy by Reda), 100% genuine Sea Island cotton; woven in Italy. Prices start at 175 USD (no VAT). Made in the USA (there are several exceptions). Brooks Brothers shirts are offered in various solid colours and various classic patterns (checks: plaid, windowpane, gingham, madras, houndstooth, graph check; stripes: candy, bengal, split, twin). Colours: grey, navy, white, blue, green, mint, pink, red, lilac, lavender, etc. Weaves: poplin, oxford, royal oxford, denim, twill, end-on-end, seersucker. Brooks Brothers are available in a very wide range of sizes (14.5 – 20 in., i.e. 37 – 51 cm. ; sleeve length options: 31 – 38). There are four fits: Milano (extra slim), Regent (slim), Madison (regular), Traditional (very loose). Collar shapes: button-down, spread, semi-spread, forward point, tab, cutaway. Button cuffs (rounded, mitred), French cuffs. Short and long sleeves. Brooks Brothers shirts often feature a chest pocket. You can buy Brooks Brothers shirts at BrooksBrothers.com, Macys.com, Bloomingdales.com or in Brooks Brothers boutiques. Brooks Brothers shirts are sometimes available on sales (up to 50% off). Brooks Brothers shirt. 100% Supima cotton. This entry was posted in Ready-to-wear, Shirts, United States by Dmitry_Vasfilov. Bookmark the permalink.